Discussion in 'Announcements' started by Panacea, May 10, 2016. Guild Expeditions is a cross-platform cooperative feature where you and your guildmates fight your way through a number of battlefields to get ahold of rewards and guild power. Expeditions begin automatically every Tuesday and last for 6 days (then they start over with a 1-day gap, much like PvP tournaments). 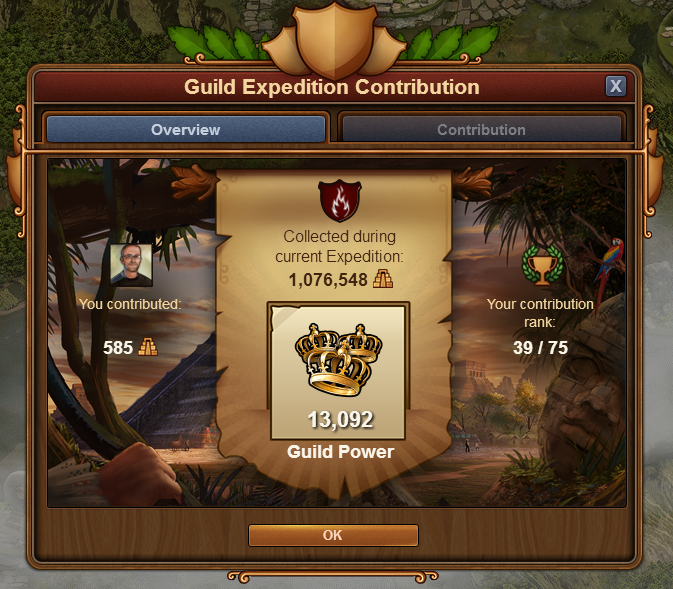 Every player who is a member of a guild and has reached the Iron Age at the time when an Expedition begins, can contribute to the success of their guild during the current Expedition (this means that if you join or create a new guild, you have to wait for the next Expedition to begin - this happens every Tuesday). 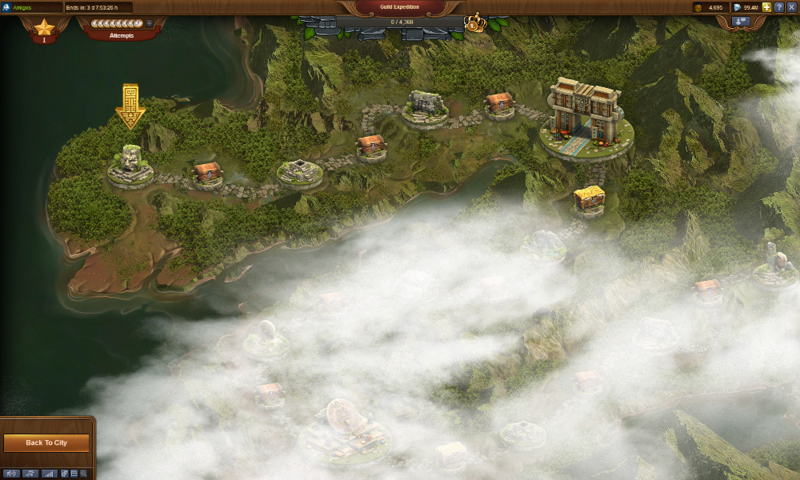 The Expeditions map is mostly covered by fog: it will clear up as you progress on the 'path of discovery'. The map you can see there, unlike the GvG map, is only visible to you - each member of your guild has their own instance of the map to discover. You have until the end of the current Expedition to complete it. What is common for all guild members though, is the Guild Expedition goal bar that you can spot right at the top of the screen (or at the bottom, if you play via our mobile app). You can contribute to the progress by solving encounters that are available at the encounter locations. The current encounter location is indicated by a yellow arrow. 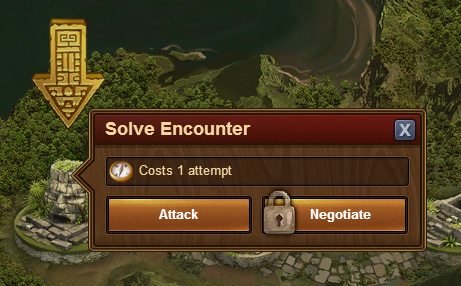 When you click it, you will trigger a battle with the invaders who occupy the spot (a peaceful way to solve encounters will also be implemented in the near future). The units' age and the overall difficulty of the encounters depend on your own advancement in the tech tree. Some encounters will be harder to solve than others (especially the ones represented by larger encounter locations) and sometimes they may even contain two-wave battles. Regardless of the result of each battle, you will contribute some points to the guild progress bar (obviously if you lose, it won't be that much). The guild goals depend on the number and era of the guild members (remember: they are set when the Expeditions begin, they will not change even if you gain or lose guild members over the week) and are shared between all guild members. When you run out of them, you can either wait for them to regenerate (you get 1 per hour) or buy them. Unlike Forge Points, the attempts can not be bought with coins, but rather with medals (or Diamonds, if you don't have any medals). The first attempts will be very cheap and then the price for each attempt will rise. At the end of the Expedition it will reset, so you have a fresh start each week. The power for your guild will be paid out each day, when the daily recalculation takes place. I've completed the map, but I can see that other difficulties are available to be unlocked. Each guild member from Iron Age - will generate a cost of 2 Iron Age goods (or 4, when unlocking the difficulty III). Each guild member from Early Middle Age - will generate a cost of 2 Iron Age goods (or 4, when unlocking the difficulty III). Each guild member from High Middle Age - will generate a cost of 3 Early Middle Age goods (or 6, when unlocking the difficulty III). Each guild member from Late Middle Age - will generate a cost of 4 High Middle Age goods (or 8, when unlocking the difficulty III). Each guild member from Colonial Age - will generate a cost of 4 Late Middle Age goods (or 8, when unlocking the difficulty III). Each guild member from Industrial Age - will generate a cost of 5 Colonial Age goods (or 10, when unlocking the difficulty III). Each guild member from Progressive Era - will generate a cost of 5 Industrial Age goods (or 10, when unlocking the difficulty III). Each guild member from Modern Era - will generate a cost of 5 Progressive Era goods (or 10, when unlocking the difficulty III). Each guild member from Postmodern Era - will generate a cost of 5 Modern Era goods (or 10, when unlocking the difficulty III). Each guild member from Contemporary Era - will generate a cost of 5 Postmodern Era goods (or 10, when unlocking the difficulty III). Each guild member from Tomorrow - will generate a cost of 6 Contemporary Era goods (or 12, when unlocking the difficulty III). Each guild member from The Future - will generate a cost of 6 Tomorrow goods (or 12, when unlocking the difficulty III). 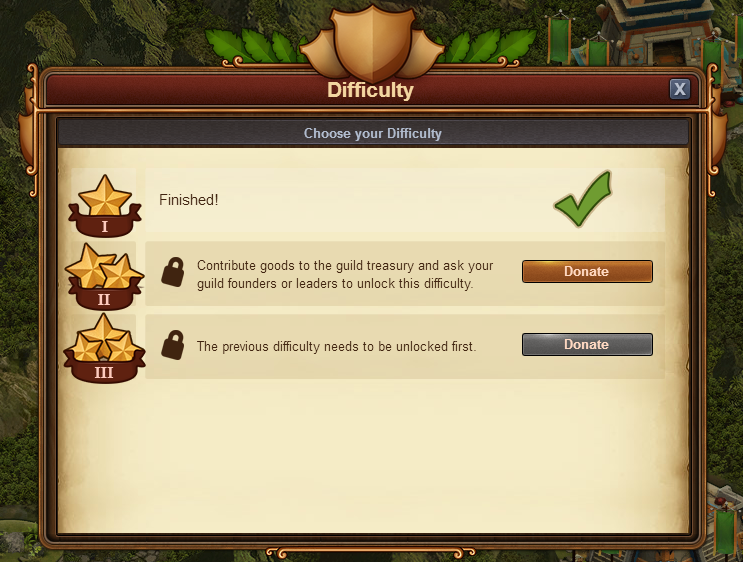 Unlocking a difficulty makes it available to all guild members who take part in the current Expedition. What is the purpose of implementing the feature and how does it influence other parts of the game? The primary reason is the fact that we were missing a cooperative feature in our mobile apps, so people playing only on mobile could never really enjoy the great feeling of reaching a common goal. We decided that this should be changed . As the goal of the Expeditions is obtaining not only personal rewards (but obviously battling is battling, so the fights will normally contribute to your personal ranking), but primarily guild power - and we are well aware that there are very advanced guilds out there - we will also raise the maximum possible guild level, which is currently capped at level 50. The new max. level will be 60. This will happen together with the activation of Guild Expeditions. You are not going to lose power that was collected in the meantime. Once the higher levels are unlocked, the power you have collected will be reflected in the new level of your guild (so it can happen that a guild being currently on level 50 will advance instantly to level 54 or so). What are the plans for the future of Guild Expeditions? As you can see Guild Expeditions are already fun for all the players who like to fight, but not necessarily for our peaceful users. It will not be a simple pay&go solution that you know from the single player map. We have something better in mind that will also be more fun for players who prefer peaceful solutions over brute force. You will hear more about it soon. What is also worth mentioning is that the balancing is still subject to change. We will not be changing anything over the course of an Expedition, but it is possible that the balancing will be different from week to week. We'd love to hear what you think and we of course will take your opinions into account, so when the Exeditions are live, please jump right into the game and try them out! We're waiting for your feedback impatiently HERE ! Guild Expeditions (hereinafter referred to as 'GE') are a completely new feature, so for an easier understanding we created this short list of new terms that are being introduced to the game. Expedition - the 6-days period during which guild members can conquer the GE map. GE map - the map which is the center of the feature. Can be accessed through a button in the main menu. GE Goal/Checkpoint - the amount of GE Points that a guild has to reach in order to get more guild power for their activity. Once a goal is reached, the game will set a new one. GE Points - the unit which is used to measure how far a guild has gotten in the current Expedition. Encounter - an instance on the map (represented by ancient ruins and temples) where you confront invaders and try to fight them off. Encounters represented by large temples are typically harder to solve than the small ones. Solving an encounter - currently: winning over an army that is occupying ancient ruins or temples. In the future a peaceful way of solving encounters will be implemented. Attempts - a chance to solve an encounter. 8 attempts are available and every time you attack invaders, you use one attempt. When all attempts are used up, you can simply wait, as they will regenerate over time (1 per hour). Alternatively it is also possible to buy them for medals or Diamonds. Attack and Negotiation - the two possible ways of solving an encounter. Currently, only attacking is possible. The negotiation will be implemented soon. Difficulty - troublesomeneness of encounters solving. There are 3 difficulty levels available. The first one is unlocked by default - when you enter the GE map for the first time, what you see is the difficulty I. The two remaining difficulties - II and III must be unlocked to be playable. The higher the difficulty, the more effort is necessary to solve encounters. But it also gets more rewarding. AyeMatey, djflashgordon and Stone Aged Deity like this.